Weight Capacity 275 lbs. Please note: This chair is custom-made and non-returnable. All fabric colors shown on your computer screen are approximate, based on the resolution of your monitor and subject to variation from the actual color on physical chairs. For more accurate ideas of color tones, etc. please contact customerservice@ergodirect.com or call 888-456-ERGO to obtain a sample or fabric swatch. Rugged and dependable, the Graphite is built to support and assist in numerous environments: cleanroom, healthcare, industrial, manufacturing, and school labs to name a few. 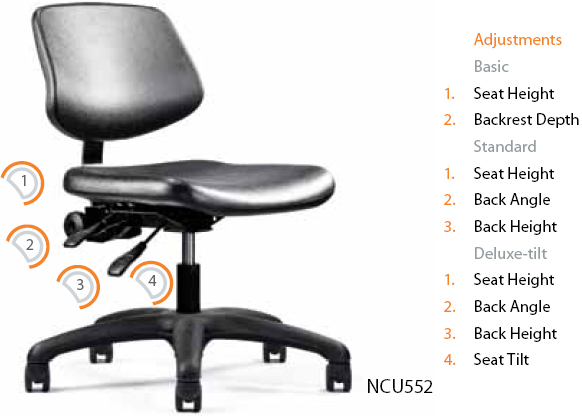 A variety of arms and adjustment options are available to allow the chair to adjust to the user’s individual working style. This is a very popular chair or stool with universities around the country. 33.5" x 26" x 26"
31.5" x 26" x 26"